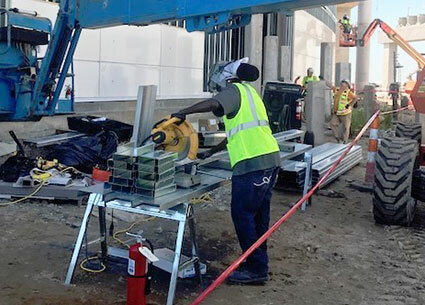 Construction work at the Louis Armstrong New Orleans International Airport is going well, thanks to some great work being turned in by Central South Carpenters from Local 1846, according to Kevin Szczudlak, project superintendent. The carpenters are working for Contractor Crown Corr, Inc.
Photo: Fritz Francis cuts metal frames while Luis Rivera and Tomas Maldonado work the basket. Superintendent Kevin Szczudlak and Daniel Rodriguez-Cruz are on the ground. Quality, timeliness, and safety—all are essential components of a construction job well done. In New Roads, Louisiana, those elements are part of the DNA for scaffold workers from the Central South Carpenters Regional Council (CSCRC), as they complete scaffold work on outages at NRG Energy’s Big Cajun II electric power plant. Fluor Maintenance, which manages the outages for NRG, is used to having that caliber of work from the Central South Carpenters, and they say they wouldn’t have it any other way. 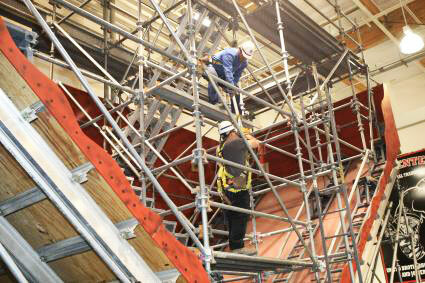 The CSCRC “responded to Fluor’s needs in providing more than 80 trained, qualified, experienced scaffold erectors for the job,” said a Fluor representative at Big Cajun II.